^ J.M. Munn-Rankin (1975). 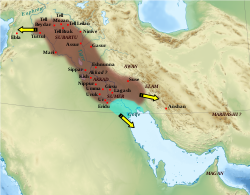 "Assyrian Military Power, 1300–1200 B.C.". In I.E.S. Edwards (ed.). Cambridge Ancient History, Volume 2, Part 2, History of the Middle East and the Aegean Region, c. 1380–1000 BC. Cambridge University Press. pp. 287–288, 298. ^ Luckenbill, Daniel David (1927). 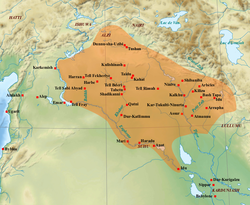 Ancient records of Assyria and Babylonia. Ancient records. 2: Historical records of Assyria: from Sargon to the end. Chicago: The University of Chicago Press. Retrieved 3 February 2019. ^ cf. Harper, Douglas (November 2001). "Syria". Online Etymology Dictionary. Retrieved 13 June 2007. .
^ Kleniewski, Nancy; Thomas, Alexander R (26 March 2010). Cities, Change, and Conflict: A Political Economy of Urban Life. ISBN 978-0-495-81222-7. ^ Frahm, Eckart (12 June 2017). A Companion to Assyria. John Wiley & Sons. p. 192. ISBN 9781444335934. ^ Charlotte Higgins (13 October 2009). "When Syrians, Algerians and Iraqis patrolled Hadrian's Wall". the Guardian. Retrieved 16 February 2016. ^ "Assyrian Community in Kazakhstan Survived Dark Times, Now Focuses on Education". The Astana Times. 19 December 2014. Retrieved 16 February 2016. ^ "The Nineveh Plains and the Future of Minorities in Iraq". www.washingtoninstitute.org. Retrieved 27 April 2018. ^ Fides, Agenzia. "Asia/Iraq – Withdrawal of the Kurdish Peshmerga militia from the Christian villages of the Nineveh Plain". www.fides.org. Retrieved 27 April 2018. ^ Hanna, Reine; Barber, Matthew (25 September 2017). "Erasing Assyrians: How the KRG Abuses Human Rights, Undermines Democracy, and Conquers Minority Homelands". 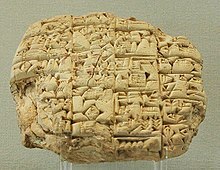 Erasing Assyrians. 1 – via Assyrian Confederation of Europe. ^ "UNPO: Assyria: Crowds Gather to Protest Mayor's Unfounded Expulsion". unpo.org. Retrieved 27 April 2018. ^ "Iraqi Kurdistan govt removes Alqosh mayor, Assyrians protest". Ekurd.net Daily News. 22 July 2017. Retrieved 27 April 2018. ^ "Iraqi Christians fear Kurdish agenda behind removal of mayor". World Watch Monitor. 28 July 2017. Retrieved 27 April 2018. ^ Browne, Gareth. "Iraq's Yazidis and Assyrians remain unconvinced by Kurdistan referendum". alaraby. Retrieved 27 April 2018. ^ a b "Assyrian Militia in Iraq Battles Against ISIS for Homeland". www.aina.org. Retrieved 17 April 2017. ^ Bennett-Jones, Owen (11 April 2016). "The Christian militia fighting IS". BBC News. ^ Martin Chulov (3 March 2015). "Christian militia in Syria defends ancient settlements against Isis". the Guardian. Retrieved 16 February 2016. ^ Matt Cetti-Roberts (7 March 2015). "Inside the Christian Militias Defending the Nineveh Plains – War Is Boring". Medium. Retrieved 16 February 2016. ^ "8 things you didn't know about Assyrian Christians". PBS NewsHour. 21 March 2015. Retrieved 16 February 2016. ^ "8 things you didn't know about Assyrian Christians". PBS NewsHour. Retrieved 17 April 2017. ^ "Assyrians: Frequently Asked Questions". www.aina.org. Retrieved 15 March 2017.